Our MISSION is to provide our customers with the best price available while offering superior products and services. Ideas Cabinets and Countertops is located in Windsor, Ontario and is a locally owned and operated professional cabinet and countertop installation service. Specializing in kitchens and baths, we offer a wide selection of cabinet types and styles, allowing us to meet the needs of any customer. With the benefit of having an on-site custom granite and natural quartz fabrication center, Ideas Cabinets and Countertops does not have to outsource any part of your project. That's the IDEAS ADVANTAGE. Come view our showroom and have your kitchen or bathroom project professionally designed and rendered in a 3-D model for you to see what the finished product will look like. Come and see about the IDEAS ADVANTAGE, your one-stop shop for all your kitchen and bathroom needs. 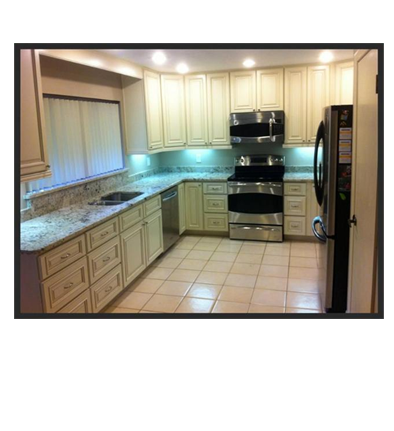 Ideas Cabinets and Countertops inc..